Before dental implant, we were limited in how we were able to replace missing teeth. Options included fixed bridges, which often required the reduction of adjacent teeth to replace a missing tooth, or removable dentures. Implant dentistry allows us to replace individual teeth, without altering adjacent natural teeth. Dental implants help retain jawbone and anchor dentures, bridges and crowns firmly in place. A dental implant is like an artificial tooth root that takes over the function of a real root. When a natural root is lost, it can be replaced with a dental implant. The implants are usually made of titanium. They are very durable and are well accepted by the human body. Dental implants have become a popular alternative to traditional, removable bridges and dentures. After dental implants are placed and the jawbone has healed, permanent teeth can be built on top of them. For example, a crown or bridge. Dental implants offer a more permanent and ‘fixed’ solution for replacing lost teeth. Types of Dental Implant crowns/dentures? 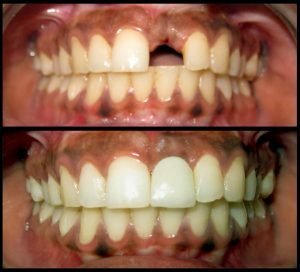 Several teeth missing – implant-supported bridge restoration or overdentures. No reduction of adjacent tooth for bridge. A ‘fixed’ and permanent solution. No worries while chewing, talking and smiling of the denture falling off. Speech is as natural as before. Is the procedure to place implant painful? It’s absolutely painless and done in the dental chair itself. Placing an implant usually takes around 15 – 20 minutes, and around 4-6 implants can be placed in a single sitting. How long do I have to wait before I get my crown/ overdenture? Usually a healing of 4-6 months is recommended. In certain situations a temporary crown or denture may be given immediately after implant placement which will be replaced after 4-6 months.